V2R Technology Is Divided In Two Phases:. Using the CT-scan images of the patient’s mouth, V2R specialists prepare and propose to the practitioner a virtual treatment plan of the surgery. The virtual treatment plan shows the optimum placement of the implants based on the patient’s anatomy and prosthetic restoration. During the CT-scan acquisition, a radiologic guide showing the final position of the teeth is used. 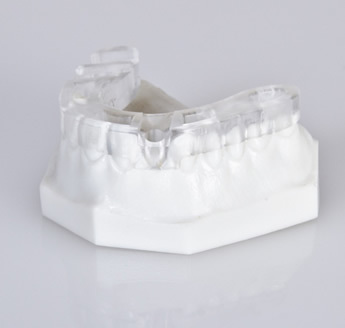 For completely (or almost completely) edentulous patients, the V2R surgical guide is fabricated from the existing prosthesis or from a replica of the future prosthesis of the patient. The V2R surgical guide is composed of two distinctive parts: the drilling template and the removable teeth part. This latest part allowed for a precise placement of the surgical guide in the mouth of the patient. Usually, three anchor pins are used to secure the surgical guide during the osteotomy. 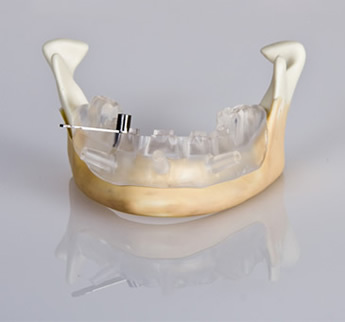 For partially edentulous patients, the V2R surgical guide is fabricated from the replica of the patient’s teeth (usually called a stone or a master model) and the guide is secured on the remaining teeth of the patient. Openings are usually performed in order to verify that the guide is fully seated. When necessary, one or two anchor pins are placed in the edentulous region for additional stability. Both types of V2R surgical guide are universal. They can be used in conjunction with most implant systems and guided surgery drill kits. DWOS™ now includes a fully integrated guided surgery workflow, which comprises: implant planning, prosthesis design, surgical guide design and manufacturing as well as immediate-load provisional design and fabrication. The coDiagnostiX™ application is a sophisticated, user-friendly software with an extensive library containing implant, abutment and sleeve systems from all the major implant manufacturers. Our unique digital workflow allows users to design digital drill guides and output the design data for 3D manufacturing. Detailed visualization of the patient situation in three dimensions provides a 360° view of the bone morphology. Easy identification of the optimal implant position and precise implant placement for predictable results. Local fabrication of drill guides increases flexibility and strengthens relationship between dentists and laboratories. Better patient communication and reliable treatment estimates build trust in implant planning and treatment. coDiagnostiX™ is an open system with a library containing more than 2000 implants, abutments and sleeve systems from all the major implant manufacturers. Additionally, the user can work with generic sleeve systems or import his own user-specific implants into the library to meet special requirements. 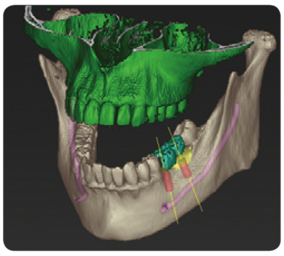 Comprehensive visualization and real prosthetic-driven implant planning enable users to achieve predictable results in advanced surgical applications. Direct import of prosthetic designs from DWOS™ CAD into coDiagnostiX™ allows for the integration of preoperative and prosthetic situations and marks a new era in prosthetic-driven implant planning. 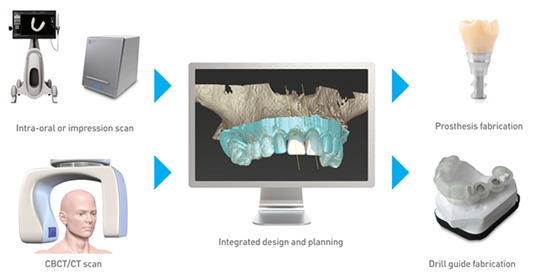 The export of preoperative planning data from coDiagnostiX™ into DWOS™ CAD allows the design and fabrication of preoperative provisional restorations. With timely and easy access to immediate provisional restorations, clinicians can significantly improve the quality of life of their patients and help to foster patient satisfaction during treatment. coDiagnostiX V9.0 is the first and only software on the market to support digital drill guide design and fabrication directly through the local laboratory. Visit the coDiagnostiX™ website for more information about this specific DWOS™ application. *The surgical guide is available for completely and partially edentulous patients.